Social Media can drive some serious ROI if done right. Vehicles like Facebook, Twitter, and LinkedIn can be used to spread a business message effectively, especially if delivered in an easy to consume and share way. The best way to do that is with video - it’s perfect for social media attention spans, so it tends to ’travel' better than blocks of text. 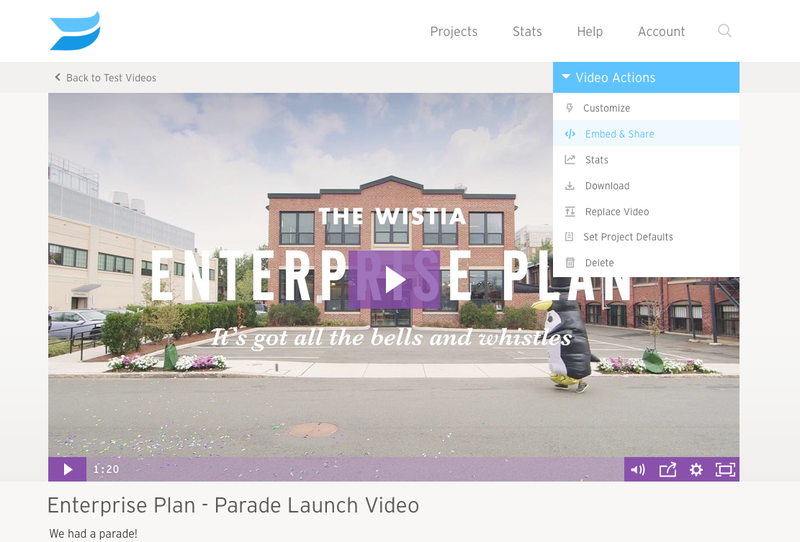 Now that you’ve got your video uploaded to Wistia, how do you share it and track the performance on Social Media sites? This tutorial will help. The three services we’re focused on here are Facebook, Twitter, and LinkedIn. Twitter is, frankly, the bee’s knees. 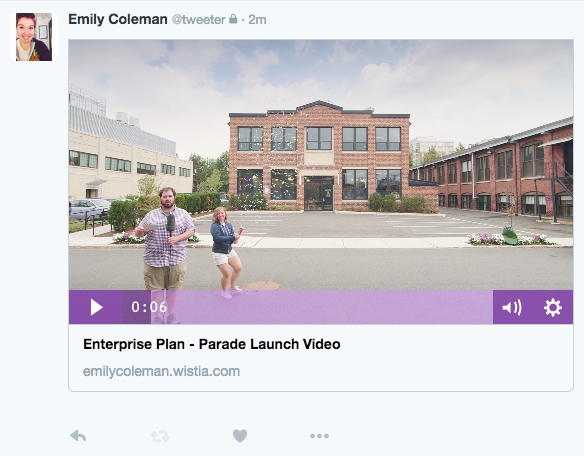 Sharing Wistia videos in Twitter is super easy. Check out how below. Twitter’s Twitter Card functionality is pretty slick - you can play media from accepted sites inside of the Twitter stream. Super useful, as it doesn’t require leaving the Twitter stream to view your video. Well guess who got Twitter Card approval? That’s right. We did! Open up the video in your account that you want to share in your Twitter feed. From the Video Actions menu, select Embed & Share. In the Embed & Share modal, select the Social Sharing tab at the top. If you don’t have a description for your video yet, you should fill one in before sharing. Descriptions show up on the Twitter cards, which makes them pretty useful for setting context for your viewers and piquing their interest. If your Project is currently set to Locked, you will be prompted to switch it to Unlocked. This means viewers who click through the link will be able to watch your video. After you click the Tweet button, the Twitter modal will appear (you may be asked to login). The default tweet text is the name of the media and the description. Once you confirm that you want to tweet the link out, check your feed! It’s like Christmas morning, except instead of presents you get your video content in your Twitter feed. Keep in mind, a user will have to hit play on the video in their feed, but that magical video treat will play right inline once they do so. 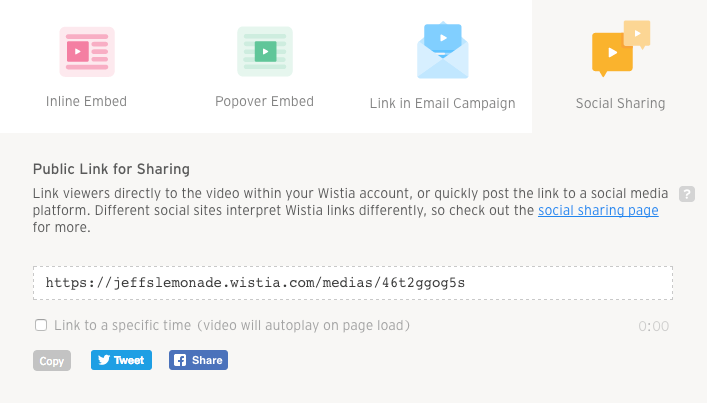 When you add the link to your Wistia video to Facebook, it will automatically embed a thumbnail for viewers to click. 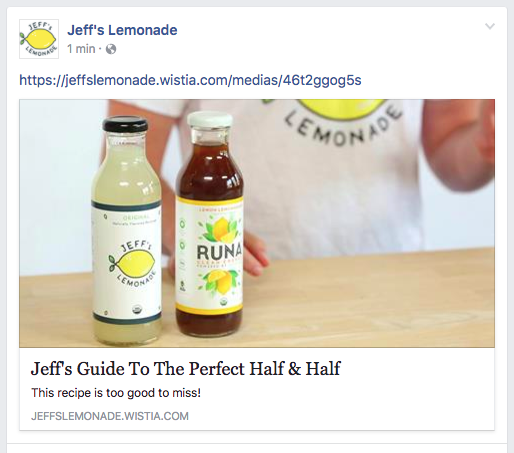 When your followers click on the thumbnail image, it will take them to the media page of your Wistia account. First, open the media in your account and make sure it has a description! If it doesn’t currently have a description, hover under the title and select Add a Description to get started. 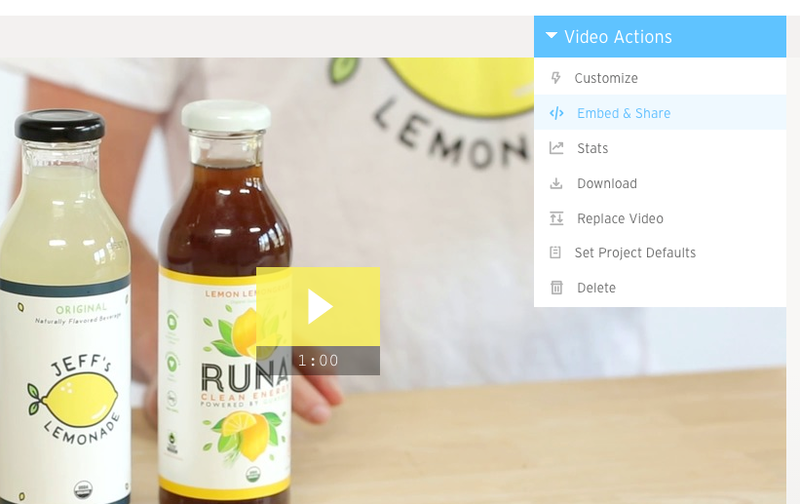 Select Embed & Share under the Video Actions menu. In the Embed & Share window, select the Social Sharing option at the top. Copy the URL from the Link box, and enter it in Facebook’s Status Update. The video thumbnail and description will be pulled in and ready to share! Once you share the update, the video thumbnail will appear instantly in the Facebook news feed. Sometimes you’re just not happy with the thumbnail that displays for your video, it happens to all of us. So you head to the Customize panel and update that beautiful thumbnail. Super easy, right? But when you go to Facebook the new information doesn’t show up for your video no matter how many times you reload the page or repost the video. Bummer! Stay calm, video friend. The good news is that we’ve got a solution: The Facebook Debugger! The Facebook Debugger allows you to input your video’s URL so that Facebook will re-scrape it for its metadata (like the video thumbnail and title). When you share content on Facebook, the shared page often contains Open Graph tags that tell Facebook which information about your video to display for your post. OG tags include your thumbnail, as well as things like the title and description. Be aware, this is technical territory! Maybe you want to post your thumbnail to Facebook, but you want the link for it to point back to your website? If so, you can use the Open Graph tags we produce for ’public' videos to accomplish this. Facebook uses the Open Graph tags to specify what content from the website should be posted. To do this, first embed the video on your website. Make sure your Project is unlocked, and add a description (descriptions are covered in the video above). These are the Open Graph tags we have created for your video. You will need to change the og:url tag to be the URL of the page where you have embedded the video (and are putting the OpenGraph tags). Add these to the head of your website, and then share the URL of that page on Facebook. LinkedIn currently accepts Wistia embeds within some areas of its platform, specifically Posts and LinkedIn Pulse Articles. Embedding Wistia videos in profiles is not supported by LinkedIn at this time. Videos embedded in a LinkedIn Pulse article will play inline on LinkedIn. To enable inline playback, LinkedIn uses a service called Embed.ly. As it stands, LinkedIn does not use Embed.ly within Posts, so videos embedded there will not play inline on the LinkedIn feed. 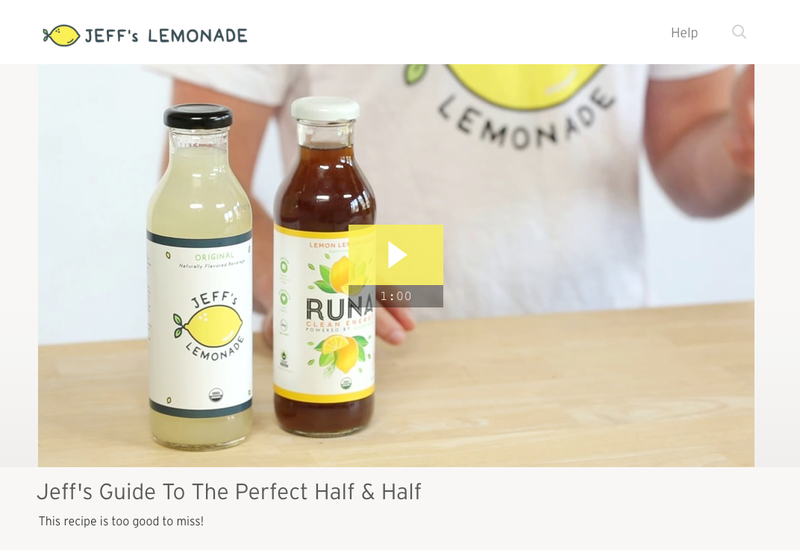 Instead there will be a thumbnail link which redirects viewers to the video’s media page in Wistia. Are you confused about why your domain restricted video won’t play on LinkedIn even though you’ve added linkedin.com to your whitelisted domains in Domain Restrictions? Don’t worry, we were confused about this for a while too. But we figured it out! To enable playback on LinkedIn while using Wistia domain restrictions, you’ll need to add cdn.embedly.com to your list of allowed domains on the Account > Settings > Account > Domain Restrictions section in Wistia. This is because LinkedIn uses Embed.ly to enable playback, so their CDN needs to be whitelisted in addition to linkedin.com. Heads up, there is one caveat to using Embed.ly to bypass domain restrictions for LinkedIn. Adding Embed.ly to the list means that your videos will be able to embedded anywhere that uses Embed.ly to enable embedding. Want your video to start a specific time? Leo’s here to help! 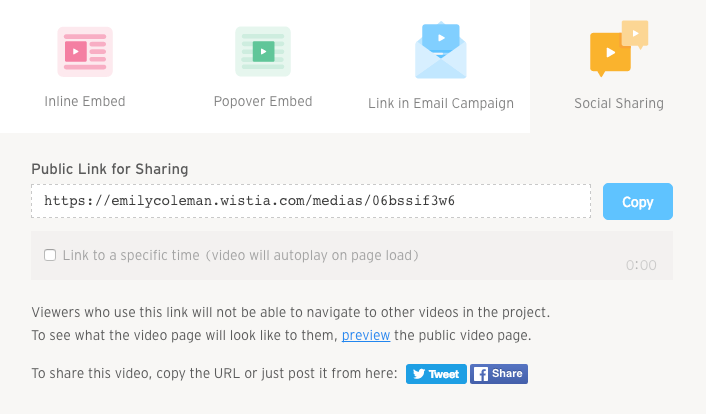 To share your video at a specific time navigate to the Embed and Share modal under the Video Actions menu. In the Embed & Share window, select the Social Sharing option at the top. Under the URL you’ll see an option to “Link to a specific time.” Clicking the box will automatically link to wherever you’ve paused the video. You can also manually edit the time stamp.